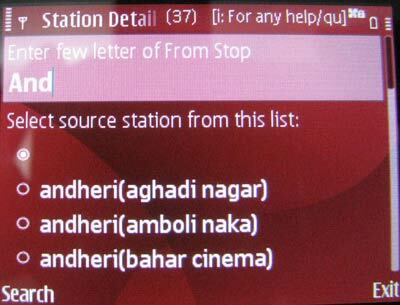 Mobile 4 Mumbai's new app allows Mumbaikars to find bus routes with a few keystrokes on their cell phones. Photo: Only Gizmos. In less than ten keystrokes, you can now find out the shortest bus route between any two points in Mumbai. Mobile 4 Mumbai, a start-up that works to create mobile solutions, has launched a mobile app that enables users to identify the buses operating between any given origin and destination. The app is free, doesn’t force the user to spend money on text messages, and doesn’t require mobile web capabilities, working on the lowest-end phones. During its pilot phase, the product received rave reviews from Twitter and other Internet followers. “I chanced upon the application and realised that BEST bus routes are at my fingertips. I can access the information, without texting or downloading GPRS. This application is a blessing and we need not be dependant on anyone to reach a particular destination. This application has given renewed confidence to the individual bus passengers,” said Moksh Juneja, a social media consultant. Transit riders – who are commonly seen confused at bus stops, even if they’ve lived in the city for years – are now able to make better sense of BEST’s 365 routes. The app was even featured in the Samsung app store last week. Mobile 4 Mumbai is currently working to extend the app’s coverage. They’re asking users to help improve it by providing missing or alternative bus stop names and bus route information. The names of the top three contributors will be shown when people download and install the application. And in another mark of their success, the developers are now getting requests from other cities, like Chennai and Bangalore, for similar applications. They seem interested. “We are planning to disseminate more information on mobile phones, to help the common citizen,” the app’s creator remarked in DNA.